Innovaciones MS. Adaptable al ancho de la silla de paseo. Se acopla en el chasis de la silla o el coche de paseo. 100% Made in Italy - Bamboom. Copertura per seggiolino auto universale ideale per i periodi caldi. Per qualsiasi problema o informazione non esitate a contattarci, ti risponderemo nel più breve tempo possibile. Ideal soporte de paraguas para proteger a ti y tu bebé de lluvia y sol, libre de la mano y logra más seguridad. Longitud máximo de 50 mm y mínimo de 35 mm, ajustable para diferentes personas. Part Number - 1959130. Manufacturer - Baby Jogger. The Options Elite tandem stroller is the perfect balance of form, flexibility, and function. For use in the rear position of stroller only and facing parent. Can be used for overnight sleeping detached from stroller on a flat surface. MPN: 42702 blue. Durable stroller with stylish design and is one of the most feature rich strollers on the market. Category: Baby Products, Instep Products, Double Strollers. EVA wheel - 6 x 12 In. Fit to car trunk. The hardworking Honey Bee bike trailer for kids is the perfect balance of value and versatility, without compromising on safety. It features seating for one or two children and includes a 1-Wheel Stroller Kit so you can convert from a bike trailer to a stroller. Der Boden ist verstärkt. Mit der Wickeltasche sind auch Sie modetechnisch voll im Trend. Kinderwagen & Kindersitze. Pflege & Hygiene. Schlafen & Wohnen. Sa. : 10:00 - 14:00 Uhr. Auf Rechnung. Zufriedene Kunden. To your little one—the trip is the adventure. And there’s so much for them to discover and do along the way. It’s the ultimate space saver opening up to a fully loaded, sophisticated ride. With a complete canopy system, all-season seat, and spring suspension technology to boot, it’s no wonder this nimble number rivals that of a premium full-fledged stroller. With the two-seat BOBGear Revolution Flex 3.0 Duallie jogging stroller, you can take both kids on any outing—whether prepping for a 10K or heading to the zoo. Adventures are boundless with the Revolution Flex 3.0 Duallie, from BOBGear, the #1 jogging stroller. The smaller your bundle of joy, the more stuff you need to carry around. Pepp Single Stroller Features Adapters included to securely fit the Nuna PIPA, Maxi-Cosi Mico, Maxi-Cosi Prezi, and Cybex Aton infant car seats. New Baby Jogger City Mini GT Compact All Terrain 3-wheel Stroller Black. We are auth. Just choose the adapter compatible with your car seat and you’ve got a customized travel system for your infant. The Burley Minnow is a single seat kids bike trailer. Upholding the Burley Standard for safety, the Minnow has: a full aluminum roll cage, 5-point harness system and passes rigorous Burley Standard durability testing. Indie, the all-terrain stroller perfect for the active family and the only one you’ll need from birth through toddlerhood. Soft, durable fabrics made from 100% recycled PET have kept over half a million water bottles out of landfills since 2011. The Bravo® LE travel system includes the Bravo® stroller, KeyFit® 30 Zip infant car seat, and KeyFit® infant car seat base. In its first mode for use with infants, the Bravo LE seat & canopy can be removed easily revealing a lightweight car seat carrier - most helpful when baby is always in the KeyFit® infant car seat or Fit2™ infant & toddler car seat. Lightweight Fashion Folding Newborn Carriage Travel Pram Baby Stroller Pushchair. 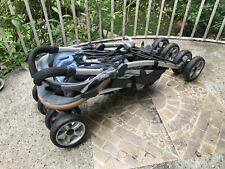 1 x Baby Stroller. -External shock springs, double shock protection, promote more stable. Detail Image. We will try our best to reduce the risk of the custom duties. Most riding options of any single to double stroller - over 20! That's 25% more riding options than City Select®. Add an infant car seat, pram, second seat, or bench seat to accommodate up to two children (infant car seat, pram, second seat, or bench seat NOT INCLUDED). Bébé de sac à langer Babymoov Dotwork. Le sac à couches star baby est un concept simple, avancés et branché seule main. L’affaire est confortable à porter grâce à une sangles d’épaule rembourrée et réglable (qui s’attache à l’évolution mat seul) et poignées de transport. KeyFit 30 Proper installation is the KEY to making your baby's world safer. Compatible with all KeyFit® infant car seats for travel system use. KeyFit 30 Infant Car Seat. The flat position and pop-up footrest create a cozy bassinet for infants with enclosure on all four sides. Whether you’re looking for a travel system, a pram, a double stroller, a triple, or just a single, the City Select could be the only stroller you’ll ever need. The City Select is not intended for jogging. Lascsl buggy board mini. New in box! Box was opened but has been resealed. All parts included.